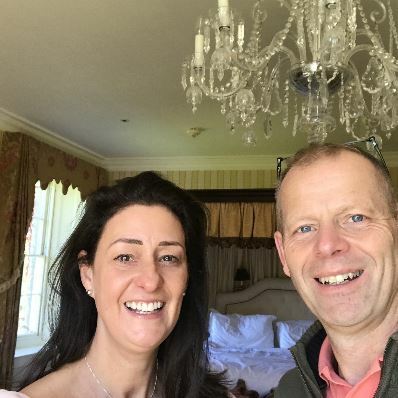 It had been a great many years since I’d had the pleasure and opportunity to visit Lucknam Park Hotel & Spa, the home away from home luxury retreat in Colerne, near Bath. In fact, the last occasion had been to celebrate my 30th Birthday. On discovering that this year was the hotels 30th Anniversary, I thought it fitting to explore this superb and memorable venue again. Driving up to this quintessential country house along its magnificent tree lined entrance, evokes a feeling of escaping into nature. The Hotel & Spa is surrounded by 500 acres of parkland and rolling countryside. A perfect tranquil haven, far enough away from the hustle-bustle of everyday life. On arrival I felt very cosseted and welcomed by the team, the burning fire in the fireplace and the warmth of the colour scheme and flower arrangements. We stayed in the Coral Suite with stunning décor and sweeping views. This Grand Master Suite was originally one of the master bedrooms of the house. Elegantly decorated with a large sitting area, an open fireplace, a dining table, writing desk and a stately four-poster bed. The bathroom has been finished using the finest marble and includes a spacious wet room. I was really looking forward to relaxing in the new spa, as I remembered enjoying it so much on my last visit. I wasn’t disappointed. The spa incorporates wood, marble and glass to reflect the warm hues of the surrounding countryside. It includes eight therapy rooms offering rejuvenating, bespoke spa treatments. The stunning 20 metre indoor pool with both an indoor and outdoor hydrotherapy pool is the perfect combination for exercise and relaxation. I enjoyed the hydro therapy pool with 3 difference types of jets. There is an outdoor pool overlooking the landscaped terraces for relaxing. We thoroughly enjoyed the thermal cabins, Japanese salt, Amethyst Room, Aromatic Steam & Sauna. All being in pristine condition and of a good size. For me it was hard to tear myself away as spa experiences are one of my favourite pastimes as I find them so relaxing and restorative. Dinner was in the stylish and contemporary Brasserie, where they provide excellent seasonal local food together with great customer service. I chose mussels and my husband Ian chose duck, both were incredibly tasty. The brasserie overlooks a pretty landscaped garden and there is also an option to eat alfresco here. The Michelin Star Restaurant Hywel Jones unfortunately, was closed on the evening of our stay, although breakfast was served in this restaurant and the choice and quality of the breakfast really shone through. I chose my favourite breakfast dish, Avocado & poached egg on Sourdough toast. Delicious! After breakfast, we decided to go for a walk and explore the grounds in the glorious sunshine. An ideal way to walk off some of our food. We walked past the equestrian centre and saw some beautiful horses being ridden by guests. The amount of activities available on site at Lucknam Park is remarkable, cycling, running, cooking and even falconry can be arranged. Well-being seems to be a real theme for the venue. A dedicated well-being house has been built behind the spa for Yoga, Pilates and speciality well-being treatments, in addition to two gyms, one inside and one outdoors! Without exception, this hotel has seriously thought of everything and provides a stunning luxury hotel with something for everyone. Thank you for such a wonderful visit, and congratulations on your 30th Anniversary! I would put this property in my top 3 hotels in this country and definitely will not be waiting another 20 years to visit.